Thomson Reuters is pleased to announce the appointment of Professor Kelvin Low as a brand new Singapore Section Editor for Property Law Review. As part of an ongoing enhancement project, we are commissioning a range of new sections to bring subscribers property law insights from academics and practitioners around Australia and internationally. Kelvin Low is Associate Professor of Law at the Singapore Management University. His research lies broadly in the field of private law, with particular focus on property law, the law of equity and trusts and contract law. He has published internationally in leading peer-reviewed legal journals, including Law Quarterly Review, Lloyd’s Maritime & Commercial Law Quarterly, The Conveyancer & Property Lawyer and Legal Studies, and is the co-author (with Tan Sook Yee and Tang Hang Wu) of Singapore’s leading textbook on land law, Tan Sook Yee’s Principles of Singapore Land Law (3rd ed, LexisNexis, 2009). His published works have been cited in leading texts in Singapore, England and Australia as well as by the Singapore courts. His works have also been cited by the Law Commissions of England & Wales, Scotland and New Zealand, as well as the Sales Law Review Group of the Irish Department of Jobs, Enterprise & Innovation. Kelvin was previously with The University of Hong Kong (2005-2009) and the National University of Singapore (2002-2004). We are delighted to have Kelvin join the editorial team and are confident subscribers will benefit greatly from his insights. 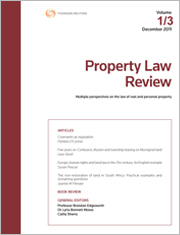 Stay tuned or follow us on Twitter for more upcoming enhancements to Property Law Review.